One page WordPress themes are very popular these days, because it comes with modern layout and provides user the option to showcase all important elements in a single page which leads to more conversion in terms of business. In this post we have collected some really beautiful and recent one page WordPress themes. So, grab any of of the following one page WordPress themes and create a page for your business. The X theme can be used as a one page site by setting up one page navigation with X on your homepage. So, this theme will be your all in one solution if you want to create a single page site or a multipage site this theme will get the job done for you. Divi is one of the most popular WordPress theme currently, and with version 2.1 the theme became a part of one page WordPress themes as well. Divi will help you to create a beautiful one page site and enable you to showcase all the important components in the home page itself, the Divi one page theme makes it even easier. 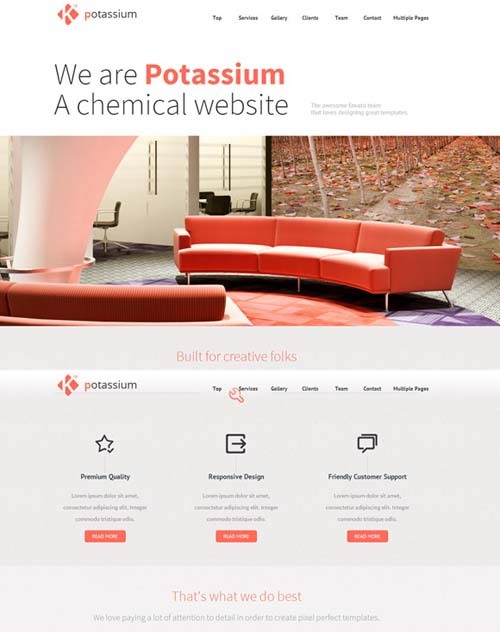 Potassium is a great premium responsive one page WordPress themes for creative agency, freelancer or any other business looking for an attractive and clean WordPress theme. K. Template is perfect flexible responsive HTML5 theme for freelancer, agency and business. This theme is really intuitive to use and it’s really pleasure to use with all our awesome features. Freelancer is a great looking one page WordPress theme from ThemeFuse. The theme is highly customizable, you can change colors, backgrounds and many more directly from the WordPress admin, in a matter of clicks. Visia is a fully responsive retina ready single page WordPress theme with a separate blog section and is suitable for any kind of creative or business use. Visa theme comes with number of amazing options to help you create a great looking website on WordPress. De7igner is a great looking one page WordPress theme, it is very professional in design which allows you to present your portfolio or the very best starting point for your own corporate website. De7igner is fully responsive resize your browser window to see it in action. All the layouts are built with responsive design in mind. It works well on desktops, tablets, and mobile devices. NASH is a beautifully simple, visually stunning, and striking ‘One-Page’ creative WordPress theme. Perfect for design agencies. The template is fully responsive, and looks amazing on your Smartphone, Tablet, and Desktop. A perfect one page WordPress theme, Express brings in tons of amazing features to your website. It’s a fully responsive WordPress theme with beautiful slider and powerful visual customizer. Auris is an ultra modern, fully responsive one page WordPress Theme which you can also use as a multipage WordPress theme. It’s an advanced, unique and powerful premium WordPress theme suited for personal one page websites/blogs, business websites, shop websites, users who want a very nice portfolio website where they can showcase their work, or for any other purpose website. It offers you custom background option as well as six navigation style to make your look spectacular. Zoo is a great looking, ultra modern single page parallax theme. Perfect for corporate, agencies, freelancers or small business. Any element can be parallaxed with zoo, using the powerful animation shortcode generator. Animations are not only limited to parallax effects, you can create all kinds of custom scrolling animations with ease. This is a great looking, fully responsive, retina ready one page WordPress theme, it comes with advanced option panel to make it easy for you to customize the theme. Kanso is a clean premium one page WordPress theme created by Satori Studio, inspired by the Japanese concept of reaching beauty through elimination and omission, arriving at thoughtful simplicity. The developer created a minimal, clean, and aesthetically pleasing, and at the same time stable, powerful, and highly flexible theme for use in agency websites, personal portfolios, photography or art showcases, as well as personal blogs and corporate websites. One of the best option for one page WordPress themes, responsive and retina ready. Just install the theme and your website is ready. A versatile & one of the best one page WordPress themes which can be used as multi page theme as well for any business or blog. Reversal is a clean, minimal and elegant one page portfolio WordPress Theme suitable for any kind of creative and business use. The theme features optional one page structure with cool side-to-side page scrolling transitions. Palette is a great looking handcrafted One Page WordPress theme with Parallax Effect. Create either one page layout or have the standard pages. Palette WordPress theme has its custom Theme Options Panel with tons of settings, starting from your site logo update to the site color changes. KRONOS WP is simple and clean one page portfolio wordpress theme. It’s perfect for any designer, photographer, illustrator, creative person or agency. It focuses on displaying a high quality portfolio, large typo presented in a really elegant way. Alamak is a responsive one page WordPress theme, it can be used for creative digital agent to show portfolio and selling services. Its build based on twitter bootstrap ,so it has powerful features. KULA is a beautifully simple, visually stunning, and striking ‘One-Page’ creative WordPress theme. It looks amazingly awesome on Retina screens (even the icons are ‘Retina Ready’), and is perfect to use, from freelancer to agency, and everything in between. WPCLOUD is a One page style design WordPress Theme suited for creative designers, photographers, bloggers, product or service landing pages and individuals. The theme is fully responsive and with a nice parallax effect. Patti is a modern and elegant one page WordPress theme, perfect for creative people, suitable for any type of business, built for any needs. Every single detail is carefully designed and crafted, in order to create a seamless and wonderful user experience. Frost is great looking one page WordPress theme which can also be used as a multipage WordPress theme with an unique portfolio which is suitable for artists, photographers, creative agencies, digital studios, personal freelancers, and any kind of business owners that would like to showcase their portfolio beautifully. Xone is a clean, elegant an modern one page WordPress theme. It is ultimate flexible with loads of nice options and features. It can be used as a multipage theme as per your requirement. We are also going to release BlackWell One Page Business Theme within few days. You can check out more about the theme here. Thanks again for sharing. Have a great day. Hi, i try it, it’s very wonderful http://goo.gl/E83Gg3 .